It’s simple! It’s just like golf, except you play it with a “flying disc” you throw. You can use a Frisbee® or any other similar brand disc. You throw it at the goal – that’s the chain thing in the picture above – and record the number of throws it took you. Just like golf! There’s an 18 “hole” course at Markham Park so get out there, have some fun and get some exercise in the process! 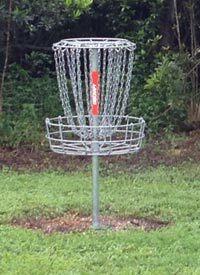 There’s even a group, the Broward Disc Golf Association, that has tournaments if you’d like to really get into the disc golf sport. Give it a try, it’s even more fun than you would expect! 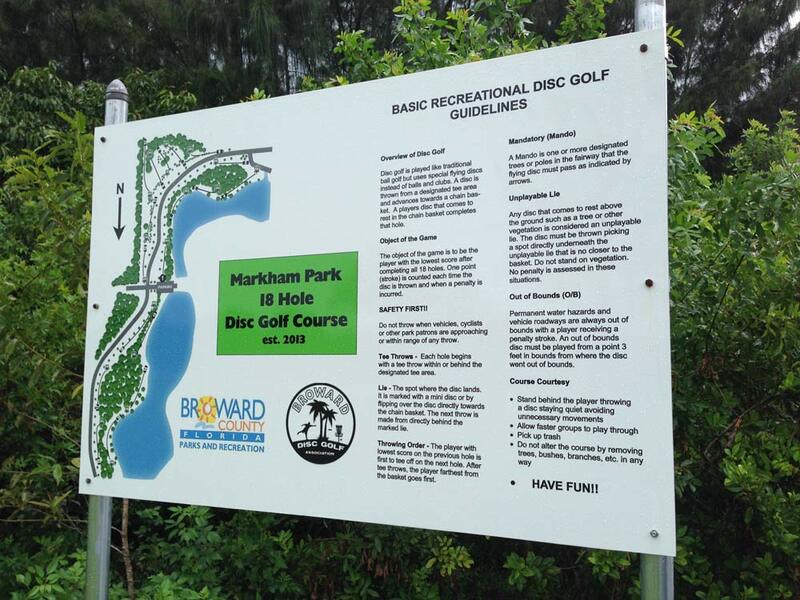 People who want to participate in disc golf can pick up a scorecard and course map at the Markham Park main office. We recommend you put your contact information on your discs. If park staff finds your disc they will contact you and hold it in the lost and found until claimed. Call the Markham Park main office at 954-357-8868 ext. 0 for questions. Safety First! Do not throw when vehicles, cyclists or other park patrons are approaching or within range of any throw. Tee Throws – Each hole begins with a tee throw within or behind the designated tee area. Lie – The spot where the disc lands. It is marked by a mini disc or by flipping over the disc directly toward the chain basket. The next throw is made from directly behind the marked lie. Throwing Order – The player with the lowest score on the previous hole is the first to tee off on the next hole. After tee throws, the player farthest from the basket goes first. Mandatory (mando) – A Mando is one or more designated trees or poles in the fairway that the flying disc must pass as indicated by the arrows. Unplayable Lie – Any disc that comes to rest above the ground, such as in a tree or other vegetation, is considered an unplayable lie. The disc must be thrown from a spot directly underneath the unplayable lie that is no closer to the basket.Do not stand on vegetation. No penalty is assessed in these situations. Out of Bounds (O/B) – Permanent water hazards and vehicle roadways are always out of bounds. The throwing player receives a penalty stroke. An out of bounds disc must be played from a point 3 feet in bounds where the disc went out of bounds. Stand behind the player throwing a disc staying quiet and avoiding unnecessary movements. Do not alter the course by removing trees, bushes or branches in any way.